The stockings have been hung. The lists for Santa have been written and mailed. To say the kids are excited is an understatement. They couldn’t contain themselves when D brought the tree upstairs and asked me 47 times if it was ready to decorate, when clearly, only the stand was done. Finally, when it was time to add the ornaments, they filled the bottom branches, double-stacking the ornaments on top of each other. At least the Little Bird can reach up a bit higher, but most of them are clustered to one area. And I’m leaving it like that, although myself pre-kids would have redone the whole thing. I have let go of my carefully planned out decorations, themes and colour schemes. I let them put up all the unbreakable ornaments I own. Christmas is fun because of them, so I wanted them to be proud of the tree. And they are, squealing with delight every night when the lights come on. Of course, the main source of all delight comes from the snowmen. The singing snowmen. Hallmark introduced these snowmen, called The Jingle Pals, in 2003. D gave me one in 2005 and I have been collecting them ever since. And the kids LOVE them! 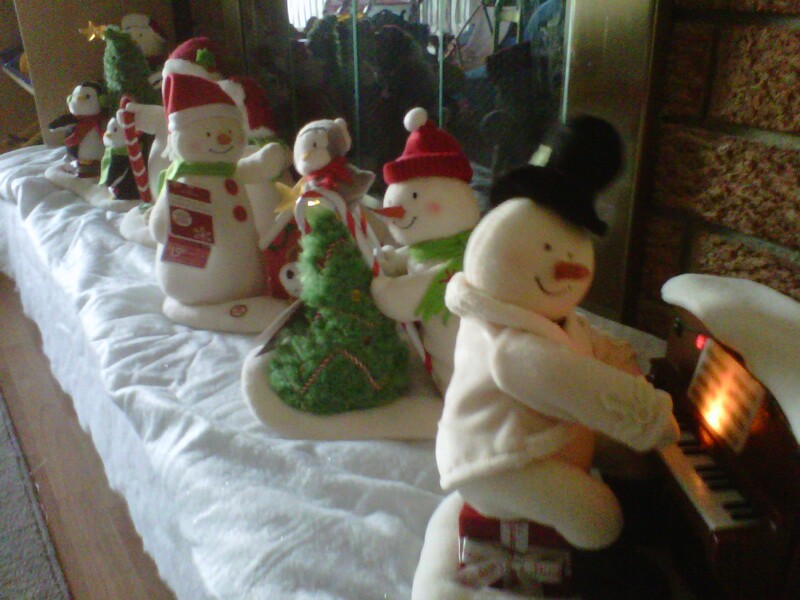 Once they knew I was decorating for Christmas, they asked me when the snowmen would come out. Over and over again! All my snowmen are displayed across the hearth, within arms’ reach. They all get pressed at the same time, making it hard to love enjoy them longer than two go-arounds. Do you know what Let it Snow, Rockin’ around the Christmas tree, Sleigh Ride, We need a little Christmas, Deck the Halls, Jingle Bells and Wish you a Merry Christmas, sound like mashed into one?! So while the kids have sing and dance to the “music”, I just remind myself that they’re only out for a month each year. Do you have any holiday collections? Traditions? Idiosyncrasies? We have the one with the two little penguins. Look forward to their grand entrance every year! Years ago, my father started giving me Nutcrackers to hang in our Christmas tree and I have continued buying them after he passed away, I have too many to count for the tree and I also have large ones scattered around the house.